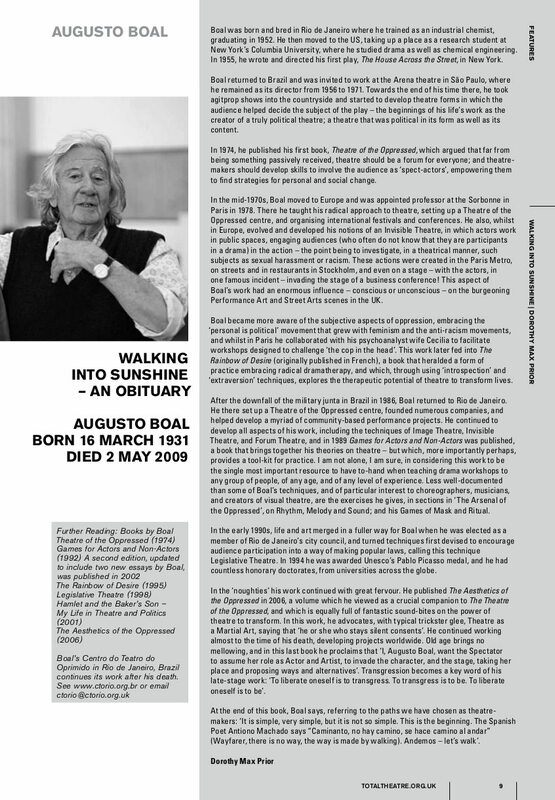 Augusto Boal: Born 16 March 1931, Died 2 May 2009. Boal was born and bred in Rio de Janeiro where he trained as an industrial chemist, graduating in 1952. He then moved to the US, taking up a place as a research student at New York’s Columbia University, where he studied drama as well as chemical engineering. In 1955, he wrote and directed his first play, The House Across the Street, in New York. Boal returned to Brazil and was invited to work at the Arena theatre in São Paulo, where he remained as its director from 1956 to 1971. Towards the end of his time there, he took agitprop shows into the countryside and started to develop theatre forms in which the audience helped decide the subject of the play – the beginnings of his life’s work as the creator of a truly political theatre; a theatre that was political in its form as well as its content. In 1974, he published his first book, Theatre of the Oppressed, which argued that far from being something passively received, theatre should be a forum for everyone; and theatre-makers should develop skills to involve the audience as ‘spect-actors’, empowering them to find strategies for personal and social change. In the mid-1970s, Boal moved to Europe and was appointed professor at the Sorbonne in Paris in 1978. There he taught his radical approach to theatre, setting up a Theatre of the Oppressed centre, and organising international festivals and conferences. He also, whilst in Europe, evolved and developed his notions of an Invisible Theatre, in which actors work in public spaces, engaging audiences (who often do not know that they are participants in a drama) in the action – the point being to investigate, in a theatrical manner, such subjects as sexual harassment or racism. These actions were created in the Paris Metro, on streets and in restaurants in Stockholm, and even on a stage – with the actors, in one famous incident – invading the stage of a business conference! This aspect of Boal’s work had an enormous influence – conscious or unconscious – on the burgeoning Performance Art and Street Arts scenes in the UK. Boal became more aware of the subjective aspects of oppression, embracing the ‘personal is political’ movement that grew with feminism and the anti-racism movements, and whilst in Paris he collaborated with his psychoanalyst wife Cecilia to facilitate workshops designed to challenge ‘the cop in the head’. This work later fed into The Rainbow of Desire (originally published in French), a book that heralded a form of practice embracing radical drama-therapy, and which, through using ‘introspection’ and ‘extraversion’ techniques, explores the therapeutic potential of theatre to transform lives. After the downfall of the military junta in Brazil in 1986, Boal returned to Rio de Janeiro. He there set up a Theatre of the Oppressed centre, founded numerous companies, and helped develop a myriad of community-based performance projects. He continued to develop all aspects of his work, including the techniques of Image Theatre, Invisible Theatre, and Forum Theatre, and in 1989 Games for Actors and Non-Actors was published, a book that brings together his theories on theatre – but which, more importantly perhaps, provides a tool-kit for practice. I am not alone, I am sure, in considering this work to be the single most important resource to have to-hand when teaching drama workshops to any group of people, of any age, and of any level of experience. Less well-documented than some of Boal’s techniques, and of particular interest to choreographers, musicians, and creators of visual theatre, are the exercises he gives, in sections in ‘The Arsenal of the Oppressed’, on Rhythm, Melody and Sound; and his Games of Mask and Ritual. In the early 1990s, life and art merged in a fuller way for Boal when he was elected as a member of Rio de Janeiro’s city council, and turned techniques first devised to encourage audience participation into a way of making popular laws, calling this technique Legislative Theatre. In 1994 he was awarded Unesco’s Pablo Picasso medal, and he had countless honorary doctorates, from universities across the globe. In the ‘noughties’ his work continued with great fervour. He published The Aesthetics of the Oppressed in 2006, a volume which he viewed as a crucial companion to The Theatre of the Oppressed, and which is equally full of fantastic sound-bites on the power of theatre to transform. In this work, he advocates, with typical trickster glee, Theatre as a Martial Art, saying that ‘he or she who stays silent consents’. He continued working almost to the time of his death, developing projects worldwide. Old age brings no mellowing, and in this last book he proclaims that ‘I, Augusto Boal, want the Spectator to assume her role as Actor and Artist, to invade the character, and the stage, taking her place and proposing ways and alternatives’. Transgression becomes a key word of his late-stage work: ‘To liberate oneself is to transgress. To transgress is to be. To liberate oneself is to be’. At the end of this book, Boal says, referring to the paths we have chosen as theatre-makers: ‘It is simple, very simple, but it is not so simple. This is the beginning. The Spanish Poet Antiono Machado says “Caminanto, no hay camino, se hace camino al andar” (Wayfarer, there is no way, the way is made by walking). Andemos – let’s walk’. Further Reading: Books by Boal Theatre of the Oppressed (1974) Games for Actors and Non-Actors (1992) A second edition, updated to include two new essays by Boal, was published in 2002 The Rainbow of Desire (1995) Legislative Theatre (1998) Hamlet and the Baker’s Son – My Life in Theatre and Politics (2001) The Aesthetics of the Oppressed (2006).